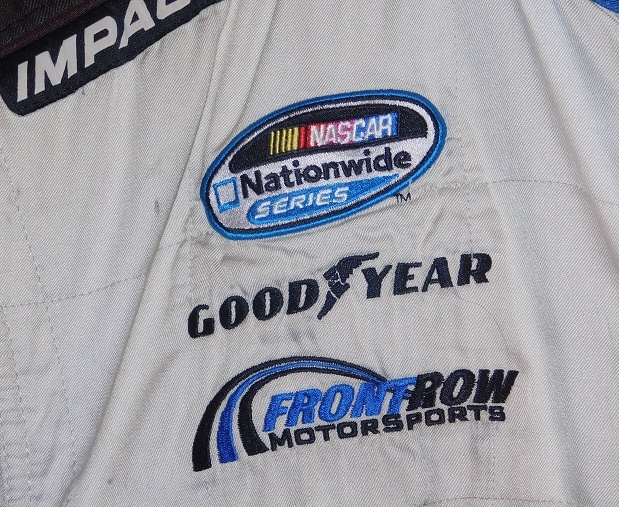 Last week, I gave a brief overview of the history of Front Row Motorsports. I primarily discussed their Monster Energy NASCAR Cup Series history. This week, I’m going to discuss their Xfinity Series history. 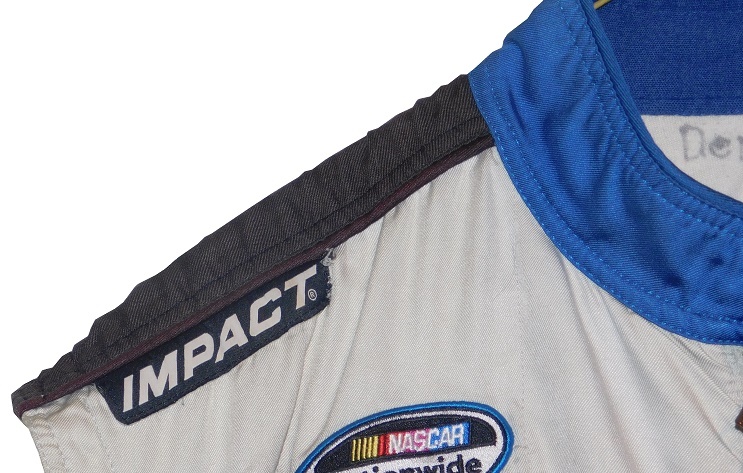 Like many Cup teams, Front Row Motorsports decided that they should expand from the Cup series to what is now the Xfinity Series starting in 2008. This is a rational decision, as many teams use driver feedback from the Xfinity Series to help their Cup cars, and often use the Xfinity Series as a developmental program for future drivers. Front Row’s efforts in the Xfinity Series weren’t great. Their driver lineup for that time period was Eric McClure for 32 races and Brian Simo for 3 races in the number 24 Chevy 2008. For the following season, Tony Raines was in the # 34 Chevy for all 35 races in 2009. Jeff Green, Kevin Hamlin and Johnny Sauter each ran a few races each in the #36 Chevy in 2010. Their efforts resulted in a top 5 and three top 10’s, as well as three laps led during that time. 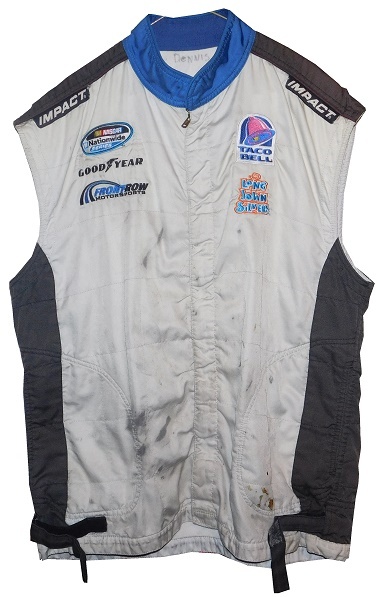 A couple of members of the Front Row pit crew wore this vest during that time. 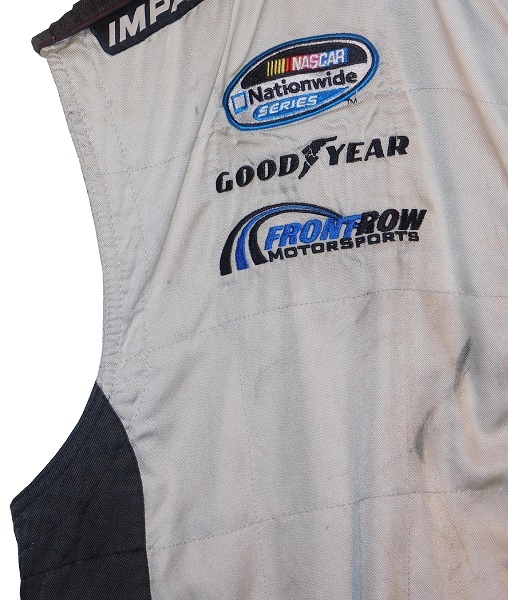 The vest shows heavy wear, in the form of a lot of stains and some scuff marks from race-use. 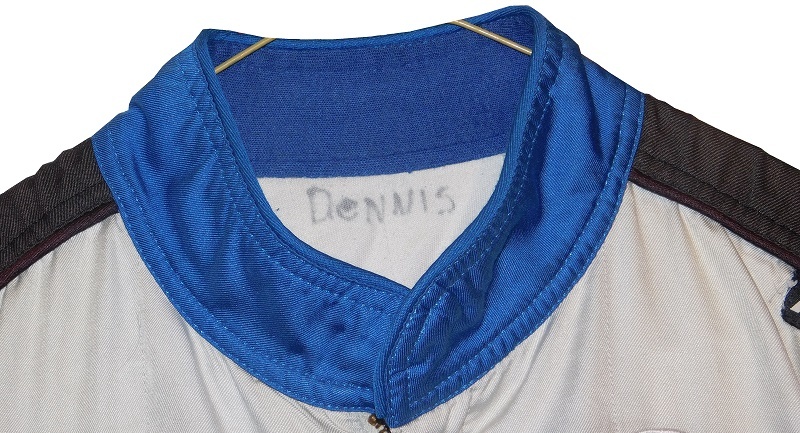 The collar is unadorned, and there is no tag in the cowl, though the name DENNIS is written in faded Sharpie .The right chest features a NASCAR NATIONWIDE SERIES logo, a GOODYEAR logo and a FRONT ROW MOTORSPORTS logo embroidered into it. 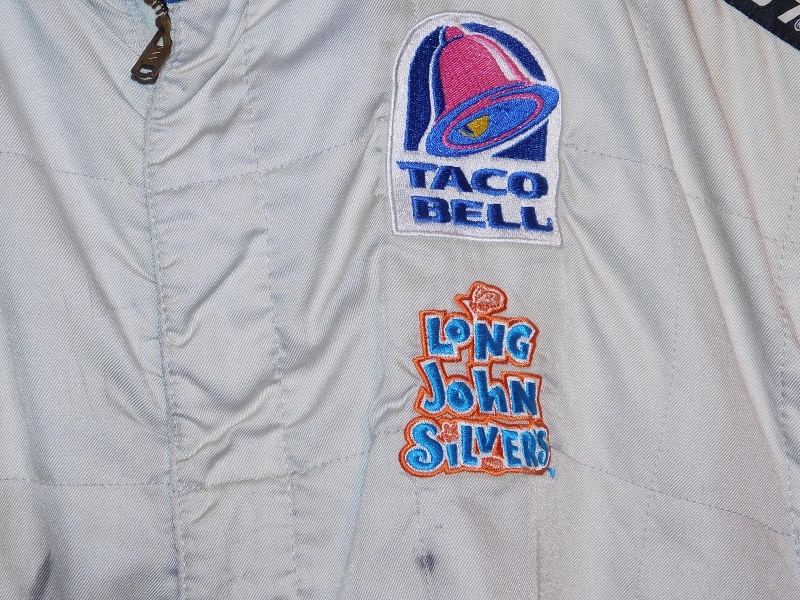 The left chest features a TACO BELL patch,and a LONG JOHN SILVERS logo embroidered. The front torso is unadorned, but it has a large amount of black staining present on the white material. 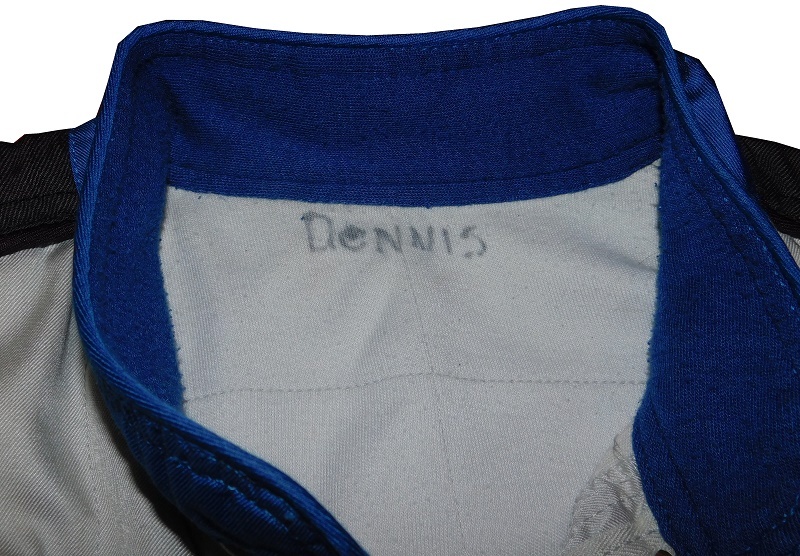 Underneath the front logo, next to the zipper is a tag that indicated that the vest was also worn by “Ryan” as that is written in faded Sharpie, and the warranty tag. 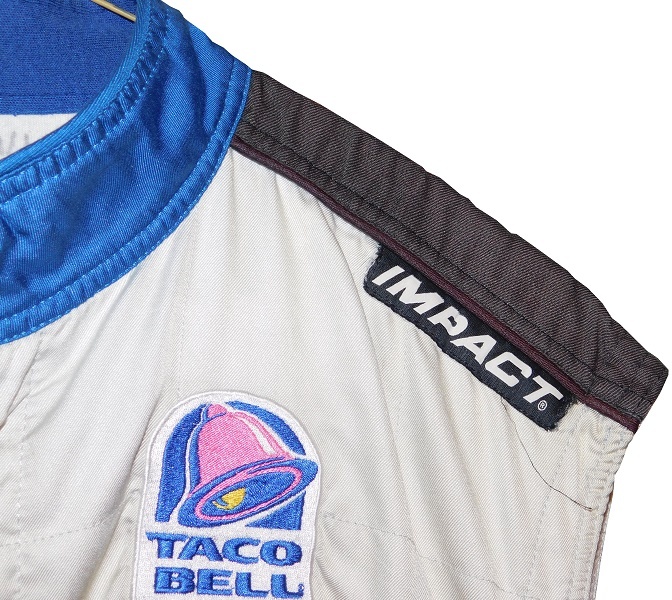 Impact has special Velcro adjustment straps on the hem, and this vest is no exception. The vest epaulets are black strips with no logos present. 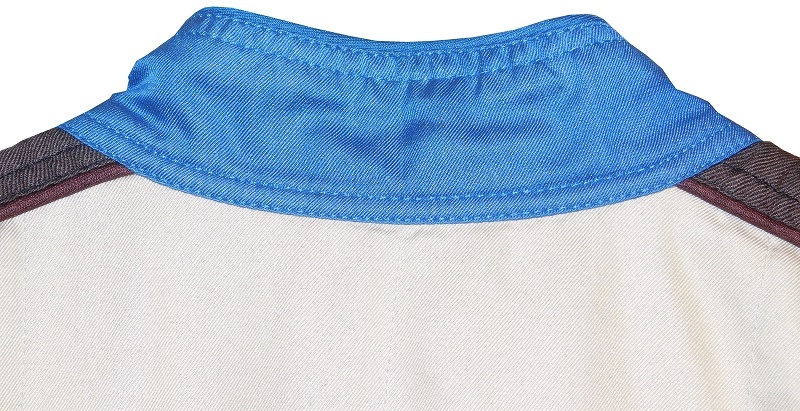 The standard vest sleeve holes are also present. 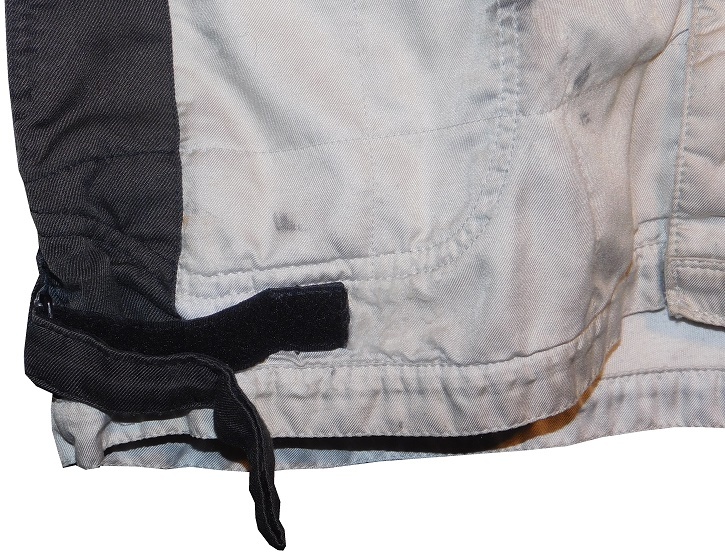 The rear of the vest is unadorned shows some dirt and scuff marks below the logo. The back of the neck is unadorned. 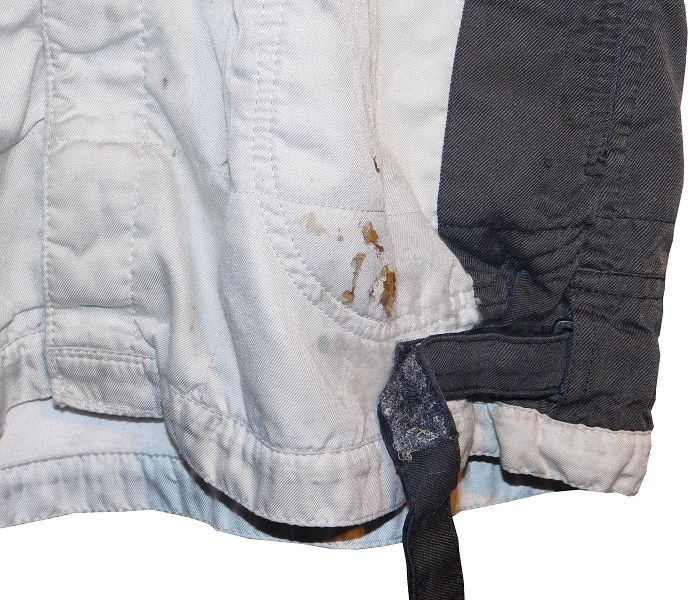 The back torso of the vest has a lot of dirt visible on the white material. While Front Row had little success in the Xfinity Series, it wasn’t enough to justify them continuing to compete in the Series, especially when they switched from Chevy to Ford in the Cup Series starting in 2010. 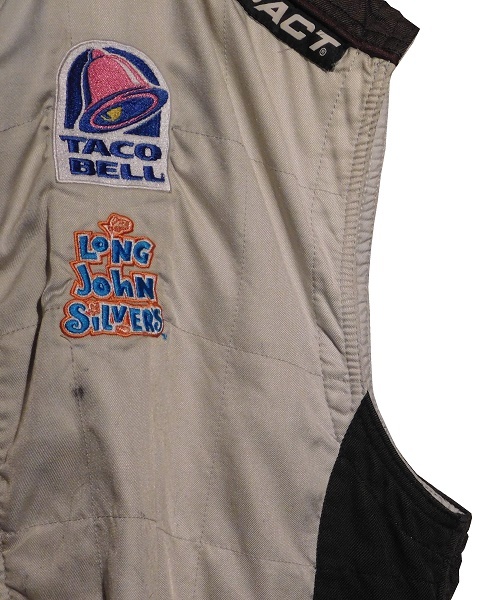 It’s also understandable that multiple crew members would wear this vest. 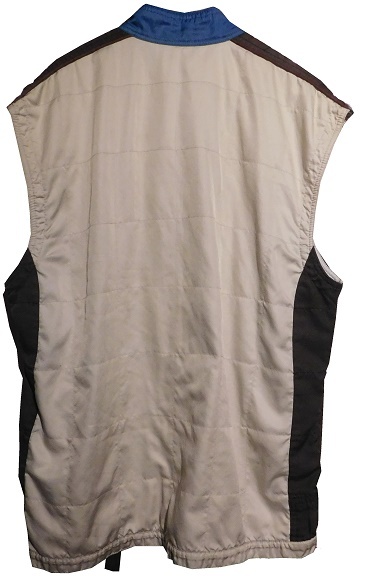 These vests, though an affordable option to one-piece suits, are still expensive to produce, and if a crew member leaves the team, the vest can still be used with another crew member. I love uniforms like this that shows a lot of wear. You don’t see that too much in racing memorabilia. Next week, I’m going to discuss a design aspect that a lot of people notice, but might not understand.